The Kromfohrlander is a rare breed, found mostly in Germany and Finland, and is very difficult to export out of Europe due to this rarity. Regardless of whether they are both wire-haired and smooth haired types are easy to groom and typically will never smell. 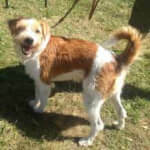 They will delight and entertain an owner with playful nature, climbing and jumping, with great agility if trained well. Members of this breed are people pleasers to their one special person and are adaptable to whatever lifestyle and living environment they need to (as long as it is indoors). Owner's will have a friend with a long lifespan of 17-18 years, although Kromfohrlanders can possibly suffer from several health issues such as epilepsy and knee/foot problems. Below are breed specs and details for the Kromfohrlander. The kromfohrlander is a medium sized dog breed. Adults average 15-18 inches tall from ground to shoulder and weigh between 20-30 pounds. Their size makes them an ideal indoor dog especially for families with limited space. As a companion dog, the kromfohrlander make a good addition to any family. They may be a bit wary around strangers and children, but once they are familiar with them they become attached for life. The breed prefers being with their owner as opposed to being alone, so owners that travel regularly should consider another breed. The kromfohrlander is a medium maintenance dog breed. Their coat is fairly easy to keep clean as it naturally repels dirt and odors, but they do shed a few times per year and will need to be brushed regularly during this period. The breed will need daily exercise, but their energy demand is not as high as other breeds so a short daily walk will suffice. 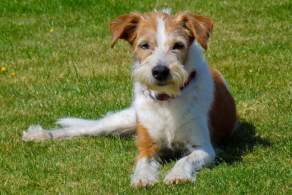 According to records of the Kromfohrlander, the first were bred during World War II in France, when American soldiers bred a stray (rumored to be a Grand Griffon Vendeen) they found with a Fox Terrier. Since the original dog was transported to Germany the breed now is mostly found in Germany and other nearby European countries such as Finland, Switzerland, Netherlands, and Denmark. Ms. Isle Schleifenbaum took in the dog (from that point dubbed 'Peter') and within 10 years had bred a uniform breed. The second home of the Kromfohrlander is considered Finland as the first puppy was sold to a Finnish woman in 1956 and this country is rumored to produce the finest. The German Kennel Club and the FDI recognized this breed in 1955 and the United Kennel Club in 1996. 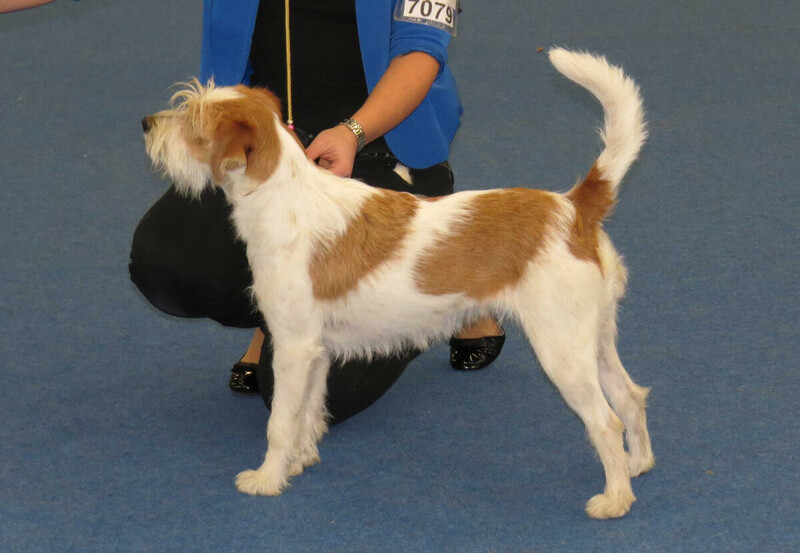 Although related to the terrier it should be noted that this breed is not a hunting or sport dog. The Kromfohrlander's coat can either be wire-haired with beard or smooth-haired with no beard. The wire-haired has a scruffy face and legs with a short body coat whereas the smooth-haired has a smooth face with feathery flyaway ears and tail. Regardless of what color this coat is, this breed should have symmetrical head markings and centered blaze between the eyes. 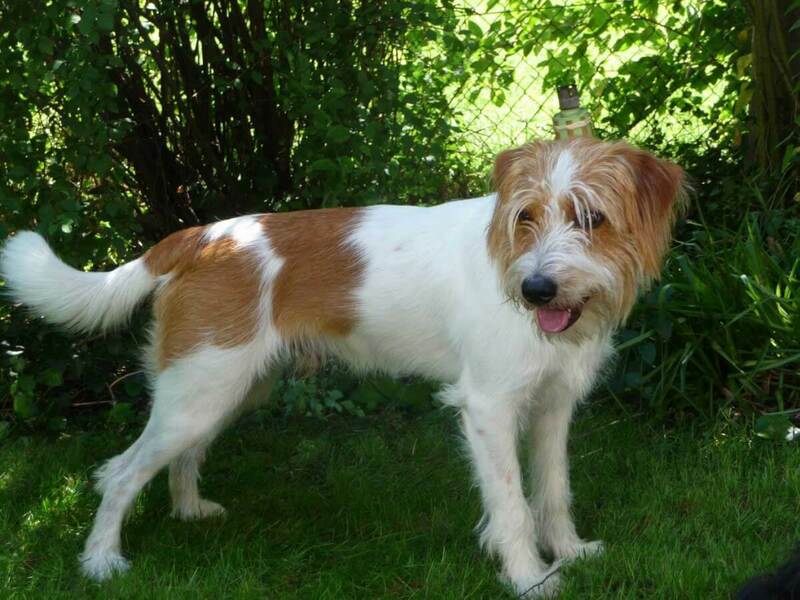 This dog's coat only occurs in two types: white and brown, also white and tan. Typically head markings are symmetrical with a centered blaze between the eyes. The Kromfohrlander is considered a medium size dog with a height of 15-18 inches and weight of 22-31 pounds. It is not prone to obesity as it may be a picky eater. The AKC describes these dogs as "simple, intelligent, and family friendly." Another important word is 'adaptable' as this breed is likely happy doing whatever you are doing. Kromfohrlanders are loyal and obedient which makes them easy to train. This is especially true towards the pet's specific owner, therefore it is considered a companion dog and is not likely to ever run away. In fact, your pet will probably follow you from room to room in order to be with its special person. This excitable dog will sneeze when happy to greet a new friend. The Kromfohrlander is easily trained due to its ability to focus for longer than many breeds. They are so perceptive of their owners that they excel with nonverbal training also (hand gestures). Although this dog enjoys spending time with its owner, he/she is also easily entertained playing with toys by themselves for a while. This is a lap-dog and people pleaser so positive reinforcement is recommended. As a family friendly dog, the Kromfohrlander is good with children. However, much like a person that prefers one-on-one interactions with others this dog also forms a close bond with his/her owner; they prefer to be in the company of that person. Although they may be hesitant around children at first, they will soon make friends. This breed is fine with other pets, especially small ones. They probably will not be very concerned with these other pets as almost all attention is given to its owner. They also have basically no hunting instinct so will not bark at or bother other pets. 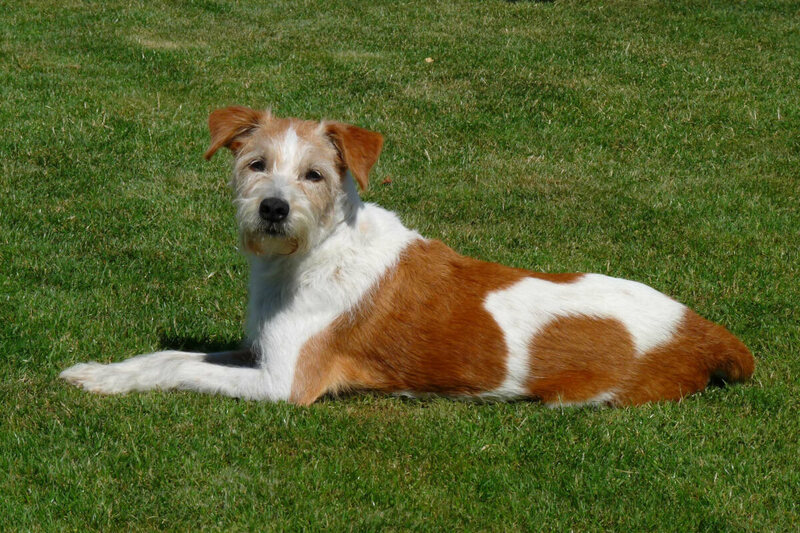 This breed is very attached to their owners, so will quickly alert them to strangers but will not bark excessively. However hesitant this pet may be at first will soon turn into friendship if the stranger is non threatening. It is important the Kromfohrlander has time to figure this new person out since it is usually very attached to its special person. 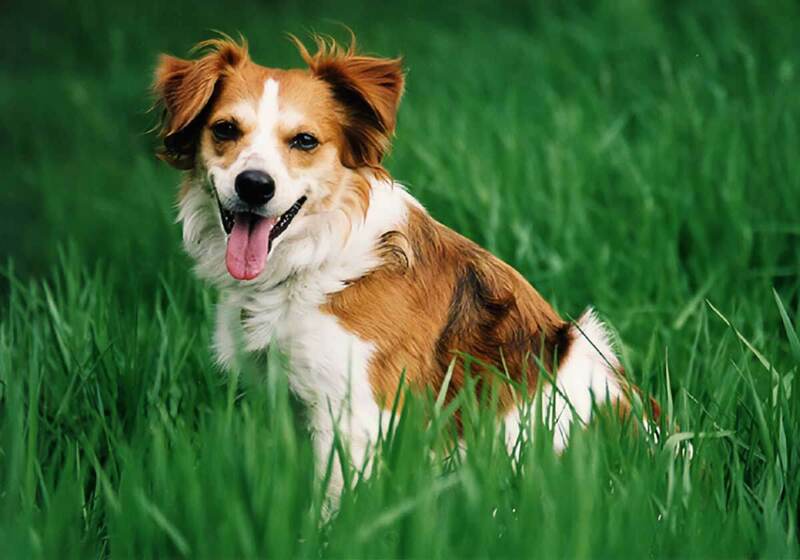 Below are pictures of the Kromfohrlander dog breed. Kromfohrlanders are low shedding dogs, shedding a few times a year, and their hair is easily cleaned up with a broom. Their coat requires little care because it naturally stays clean. 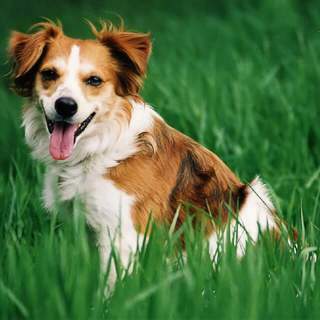 This breed is said to be picky with food, however, with good quality or raw diet your pet can have a normal appetite. This breed enjoys climbing and jumping and should be played with daily, however they will most likely be happy doing whatever you are doing. This is not a dog that has a "dog smell" odor. Its coat requires little care and stays clean even after all their playtime. Occasional shedding occurs (a few times per year). These are joyous, playful, entertaining, and simple dogs. This is an intelligent breed that is easily trained, especially in agility and tricks. The Kromfohrlander is adaptable because it likes to do whatever its owner does and, therefore, will go outside to play with its owner or sit on the couch. Members of this breed would not like to be in a crate or in a yard for the majority of the day, not because they cannot adapt to the owner's schedule, but because they form a special bond with their owner and would prefer to be with him/her. Therefore, they would be fine in an apartment or house. If left in the yard they may dig a bit. There seem to be no specific temperature requirements for this breed. Keep in mind this dog will not be at optimal happiness kept in a yard, so indoor temperature is most likely ideal for these pets. This dog is considered to have a long lifespan of up to 17-18 years. Due to limited genetics though Kromfohrlanders may suffer from a health issues typical to the breed. Epilepsy (seizures), cystinuria (high amount of amino acids in urine), as well as knee and foot issues. 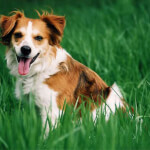 Below are common health issues with the kromfohrlander dog breed.